Fertilizers and manure are often applied in the fall to help crops get off to a good start the following spring. There’s some new research, however, that indicates the practice may not be as productive as farmers think. 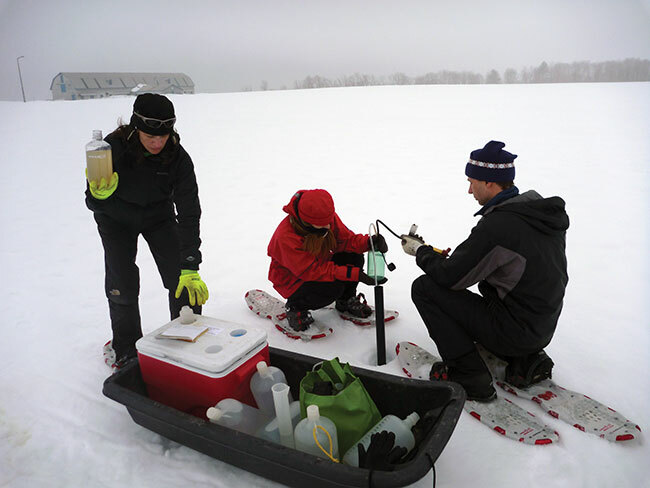 Normand Bertrand was among the members of Martin Chantigny’s team assessing soil nitrous oxide emissions during winter in Quebec in 2010. Fertilizers and manure are often applied in the fall to help crops get off to a good start the following spring. Martin Chantigny, an Agriculture and Agri-Food Canada scientist in Quebec specializing in soil biochemistry and nutrient cycling, and Claudia Goyer, a molecular bacteriologist at the AAFC’s Fredericton Research and Development Centre in New Brunswick, recently co-led a national study on biological processes in the soil aimed at devising better ways to utilize essential nutrients required for plant growth. Their research showed biological nutrient cycling continues at below zero temperatures throughout the winter, and that this soil activity can lead to nitrogen losses through nitrous oxide emissions or leaching. The studies also showed that soil activity over winter also affects phosphorus and carbon levels available for spring growth. Goyer says while it’s commonly believed there’s not much going on in the soil in the winter months, up to 80 per cent of the nitrous oxide gases from the natural breakdown of plant material, fertilizers and manure by microorganisms in farmers’ fields are produced during this period, particularly during spring thaw. Because of these emissions, the amount of fall-applied nitrogen left in the soil that’s actually available for spring growth could be as little as 10 or 15 per cent, according to Chantigny. “Depending on the site, what we’ve seen is that at least half of the available nitrogen applied in the fall is generally lost, whatever kind of the nitrogen source it is,” Chantigny says. Chantigny suggests farmers who choose to apply fertilizers or manures after harvest may be better off delaying it for as long as they can in the fall. “I would say the applying as late as possible in the fall just reduces the period of time where nitrogen will be left in the soil without any crop uptake. It probably increases the odds for a good nitrogen recovery in the spring,” Chantigny says. Chantigny and Goyer were among 17 soil scientists who participated in the research initiative funded by Growing Forward 2 which wrapped up this past spring. Research was coordinated across dozens of sites at AAFC research centres in B.C., Alberta, Manitoba, Ontario, Quebec and New Brunswick, along with research partnerships with a number of Canadian universities. Goyer’s study in New Brunswick involved potato and barley crops and focused on the impact of snow depth on nitrous oxide emissions. 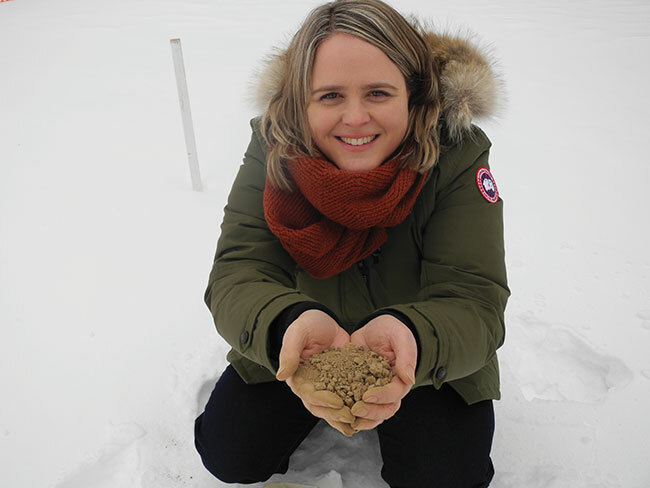 She says her research indicated that colder soils that have less snow cover over winter will have greater microbial activity and produce greater emissions as a result. Goyer says the findings were the opposite of what one might expect, since snow can act as an insulating cover. She points out that while colder soils with less snow cover typically contain less oxygen and experience deeper frosts that can kill microorganisms releasing the soil organic carbon that favours denitrification, there is such a diversity and abundance of microorganisms in soil that the remaining microorganisms will be very actively releasing nitrous oxide. Nitrous oxide is a greenhouse gas, and Goyer believes that by reducing nitrous oxide emissions this not only helps fight global warming but also results in reduced nitrogen losses that can benefit growers by keeping more nitrogen available in the soil for plant growth. “One of the effects of denitrification over winter is that you’re losing some of the nitrate that could be useful for your crop in the next spring,” Goyer says. 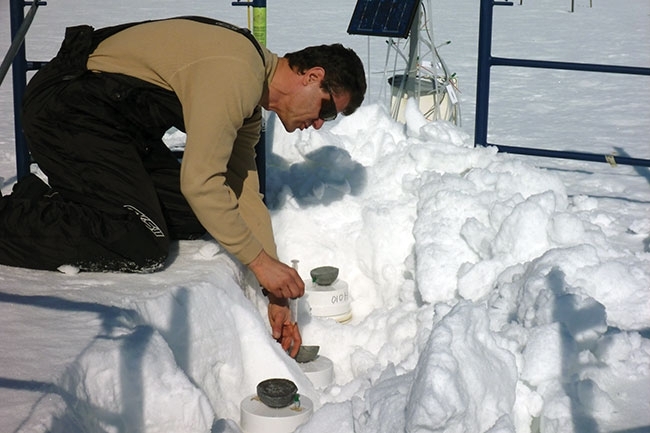 Normand Bertrand was among the members of Martin Chantigny’s team assessing soil nitrous oxide emissions during winter in Quebec in 2010. Chantigny first began his soil research in this area back in 2009 under a Growing Forward 1 initiative, and he continues to build on this work. Chantigny is still monitoring test plots with corn and cereal crop systems at the Normandin Research Farm that’s part of the AAFC’s Quebec Research and Development Centre in Quebec City, but he’s expanding his focus to include perennial crops as well. “For my part I am continuing to see if the story is the same or if it is different when you have a perennial crop on the soil, so at the moment we are also measuring greenhouse gas measurements and looking at microbiological communities in the presence of perennial grasses and legumes,” he says. Chantigny maintains one of the main objectives of his soil fertility research is help growers come up with improved farm management practices that could help increase nutrient use efficiency and reduce nutrient losses. Applying nitrogen fertilizer later in the fall could be one such practice, but Chantigny cautions that weather may render a fall nitrogen application relatively ineffective, regardless of the timing. “If there’s much snow over winter or a lot of water entering the soil in the spring before seeding, you may lose nitrogen [through leaching] even though you have applied it in the very late fall. You still are taking a chance, I would say,” he says. Chantigny is also looking into effective additives that could reduce nitrogen and phosphorus losses after manures and fertilizers are applied in the fall. “We are testing some nitrification inhibitors that prevent all the nitrogen in the soil to be transformed to nitrate, says Chantigny, adding that the results so far have been quite variable. “We don’t have enough data yet to say, ‘yes that’s a good way to do things,’” he says. Chantigny notes that nitrification inhibitor products on the market are generally expensive. He says more work is necessary before researchers can weigh in on their cost-effectiveness. In addition, Chantigny is investigating the question of how soil nitrogen reserves are mineralized and released in the spring and their role in early season plant growth. “That seems to be a very important mechanism that we really have a hard time predicting at the moment, and we really want to know more about how to predict it,” he says. Chantigny is co-leading the project with Xiying Hao, a soil scientist at the AAFC’s Lethbridge Research and Development Centre in Alberta. 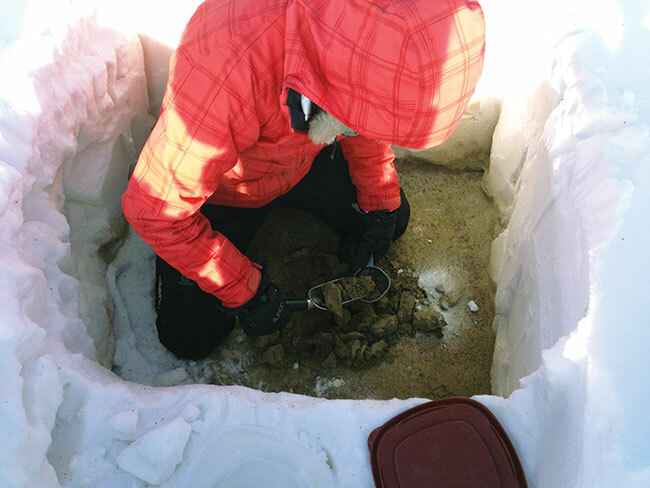 The research sites are located in Quebec, Alberta and B.C., and researchers from United States, Europe, China, Brazil and New Zealand are also providing soil samples for testing.